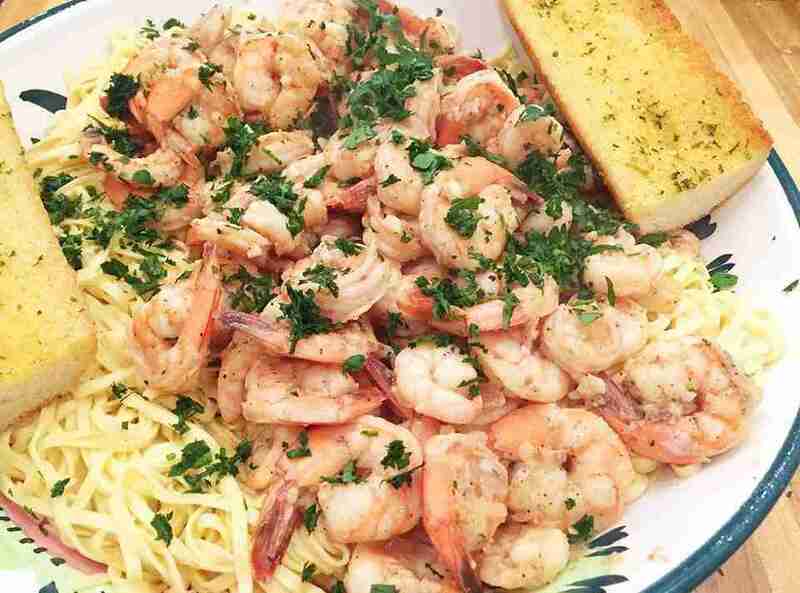 When I think about shrimp scampi, the first thing that comes to mind is the symphonic simplicity of garlic, fresh pasta and shrimp – a few ingredients sourced right all showcasing each other perfectly. Use good butter and olive oil. I prefer unsalted European creamy butter and good organic olive oil. I also think about garlic and how most recipes just do not call for enough of it. Not mine, oh no, I use extra garlic in this recipe and to top it off, instead or red pepper flakes for heat, I use the Melinda’s Garlic Habanero Sauce. A perfect addition to a perfectly delicious recipe. So let’s do this! Use a pasta cooker or a large stock pot. Bring 8 to 10 quarts of water to a boil. When it has come to a boil, add a few pinches of salt, a drizzle of olive oil and the linguini. If the pasta is fresh, reduce to simmer and cook for 2 to 3 minutes. If dry, boil for about 6 to 8 minutes or until the pasta is al dente (see instructions on the box). Drain the pasta. Use a large skillet, 10-12 inches, add 2 tablespoons butter and 2 tablespoons olive oil over medium to medium-high heat and sauté the shallots and garlic for 3 to 4 minutes, stir frequently so the garlic doesn’t burn (keep an eye on this step). Season the shrimp with salt and pepper; add them to the pan and cook until they have turned pink, a few minutes on each side should do. Remove the shrimp from the pan and reserve. Add the wine and lemon juice and bring to a boil, allow the wine to cook off or reduce at bit and then add 2 more tablespoons of butter, olive oil and the hot sauce. When the butter has melted, remove from the heat and return the shrimp to the skillet. Stir well and season with salt and pepper to taste. In a large serving bowl, incorporate the contents of the skillet and the pasta, drizzle a little more olive oil and sprinkle the parsley and Parmesan cheese and serve immediately with garlic bread and a salad.